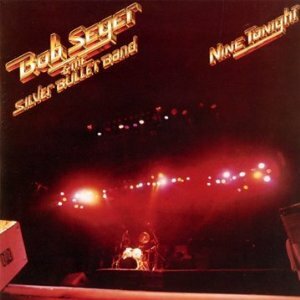 Nine Tonight is the second live album by Bob Seger and the Silver Bullet Band. It was recorded in 1980 in Detroit when Seger had become an international superstar. Before his first live album, Live Bullet, Bob Seger was a hard working rock’n’roll singer who had gained a great reputation in his home territory of Detroit, Michigan but he wasn’t well known or very popular elsewhere in the USA or internationally. Live Bullet is a fiery, energetic set which demanded attention and Seger had the nous to capitalise on it with his following commercial studio albums, Night Moves and Stranger In Town. Releasing Nine Tonight was an obvious move to give the fans a chance to hear the new Seger show with the hits. This album was remastered in 2011 and an extra song – Brave Strangers – has been added. Five songs from Against The Wind, five from Stranger In Town and four from Night Moves mean this album is heavily biased to Seger’s most recent albums. I will be writing a full review. It’s been playing in my car and I’ve found it extremely difficult to take out because it sounds sooo good. It’s much smoother than Live Bullet so it’s more for classic rock fans than people who like their music hard and heavy. Nine Tonight is overlooked by the best live album ever lists with the focus on Live Bullet but this has the big hits. Reviews at Amazon are very positive with only a few people who have been disappointed. Is this the best live album by Bob Seger? I ask readers to help me to find the best live albums by voting in polls. This entry was posted in 1980s Live Albums, Classic Rock Live Albums, Singer Songwriter Live Albums and tagged 1980 live albums, 1980s classic rock, 1980s Songwriters, Bob Seger Live Albums, classic rock 1980, Live Rock Albums With Saxophone, SS S by Paul Simister. Bookmark the permalink.